When in Manila, don’t you wish you could kick back for a while in the calm and tranquil countryside away from the busy urban Christmas jungle? The Season of Giving in the city is madness! A few days ago, I visited Gawad Kalinga’s Countryside Christmas Fair held at the Gawad Kalinga Enchanted Farm in Angat, Bulacan. It was a busy day with visitors, facilitators, concessionaires preoccupied with the hustle and bustle of the fair and the numerous activities on-going at the Gawad Kalinga Enchanted Farm. Pride and patronage for local products and produce is the order of the day, with the numerous local entrepreneurs offering their best homegrown goods to mingling patrons. Aside from their advocacy and support for local agri-businesses, Gawad Kalinga also extends their generosity to our brothers in Visayas, struck by typhoon Yolanda. The proceeds of the GK Countryside Christmas Fair has been donated to relief efforts in Central Visayas, for rebuilding 5,000 roofs and and constructing 20,000 new homes. GK Volunteer, Wowie, gives a short orientation and introduction to some of the local businesses present at the GK Countryside Christmas Fair. We arrived at the Gawad Kalinga Enchanted Farm around lunch time. It’s quite a long drive, but you will see signs along the road leading to it, so you need not fret about inverting your clothes for fear of being lost. In the meal area of the farm, families and groups of different ages and nationalities abound. 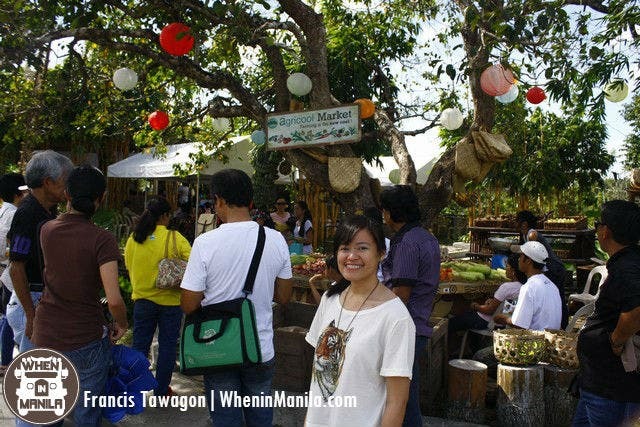 Most were there for the activities to be held at the fair, some were visiting to tour around the Enchanted Farm, some were Gawad Kalinga volunteers, while others simply wanted to purchase and check out locally made products from some of the best agri-businesses around. These immortal wise words of John Lennon are embodied by the efforts of the Gawad Kalinga volunteers who work for the Enchanted Farm to be the canvas for Gawad Kalinga’s second phase of the 2024 road map to end poverty in the Philippines. Jay Delfin, a senior GK volunteer, shared the success stories of the businesses that were founded and built with Gawad Kalinga, his fellow volunteers who devote their time to the organization, and their goals for the coming years that span a widespread nationwide scale. It was a hearty lunch indeed with the stories and anecdotes that Sir Jay shared. Gawad Kalinga has supported a lot of local businesses and enterprises and has helped them to expand and grow, such as Agricool, Bayani Brew, Circle Hostel, Enchanted Farm Cafe, Enchanted Water, Golden Egg, Grassroots Kitchen, Hamlet, Human Nature, Plush & Play, Theo & Philo, Trese, and more. Families have also found a home at the GK Enchanted Farm and have settled there with all the basic necessities they need: food on the table, a roof over their heads, education, livelihood programs, and a caring community. It’s amazing how much the Enchanted Farm has grown in just a span of two years. All this was made possible by peoples’ generosity, the volunteer efforts of many, and a simple dream. Acacia Hotel Manila:A Filipino Five-Star Luxury Hotel in the South of Manila!